Enjoy the music of the Moody Blues at Lincoln’s Theatre Royal this month in the company of five legendary musicians, singers and songwriters. 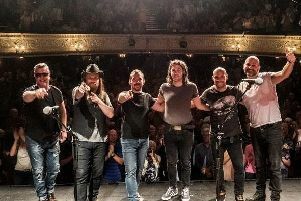 Drummer Gordy Marshall and keyboard player Paul Bliss come direct from performing on the Moody Blues’ 2015 nationwide tour and are joined by current 10cc lead singer Mick Wilson, Leona Lewis and Westlife guitarist Tim Maple plus James Blunt and Joss Stone bass player Malcolm Moore. Legend of a Band is the chance to experience impeccable performances of classic Moody Blues hits including Nights in White Satin, Go Now, I Know You’re Out There Somewhere, plus Justin Hayward’s Forever Autumn and a show-stealing rendition of Eve of the War from Jeff Wayne’s War of the Worlds. Legend of a Band - A tribute to the Moody Blues - is at Lincoln on Thursday, March 24 at 7.30pm.